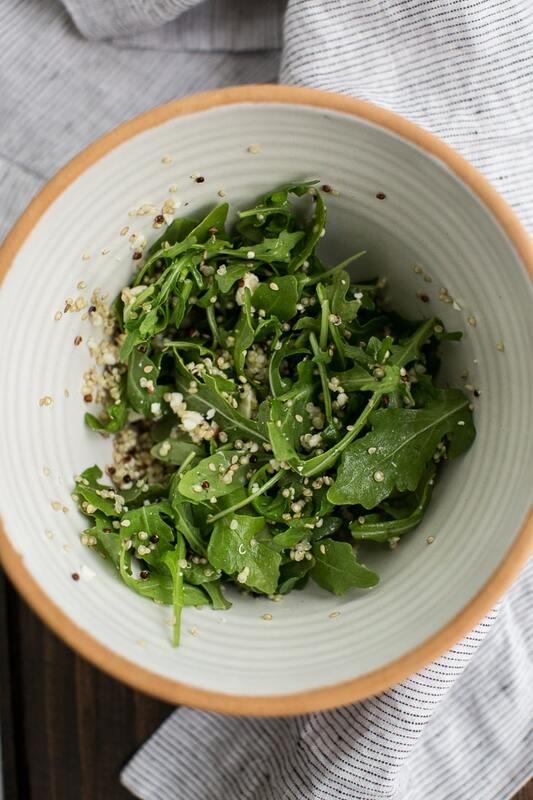 Without realizing it until the past couple of days, I’ve had another craving that’s popped up on the blog over the past few months: arugula. For whatever reason, this slightly spicy green has slowly replaced lettuce in my salads and become my go-to green. The first time I tried arugula from the CSA, I remember not quite being sure about this green. Each variety had a different flavor, ranging for mellow to peppery while the texture was just slightly different from lettuce. For this curried acorn squash, I used a red curry paste but it would be easy enough to use a curry powder mixed into the greek yogurt instead. If you want to keep this vegan, take out the feta and swap out the honey (pretty easy fixes.) I’ve also been known to add a few chickpeas for a bit of extra protein. Preheat oven to 400˚. Slice acorn squash in half and remove seeds. Cut of a small slice on the bottom of each acorn squash half to create a level surface so that the acorn squash doesn’t rock. 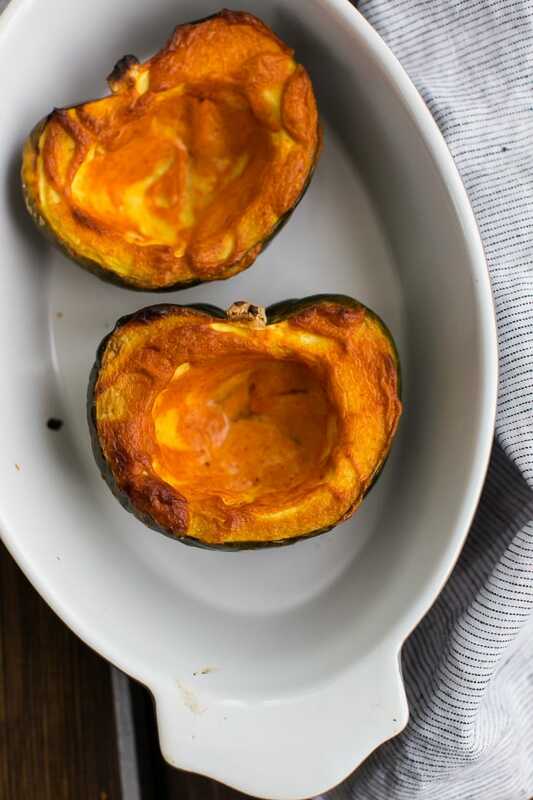 Place the acorn squash in a roasting pan. In a small bowl, stir together the greek yogurt and thai curry paste. Spread the yogurt over the flesh of the acorn squash. Place in the oven and roast until squash is tender, 40-50 minutes. 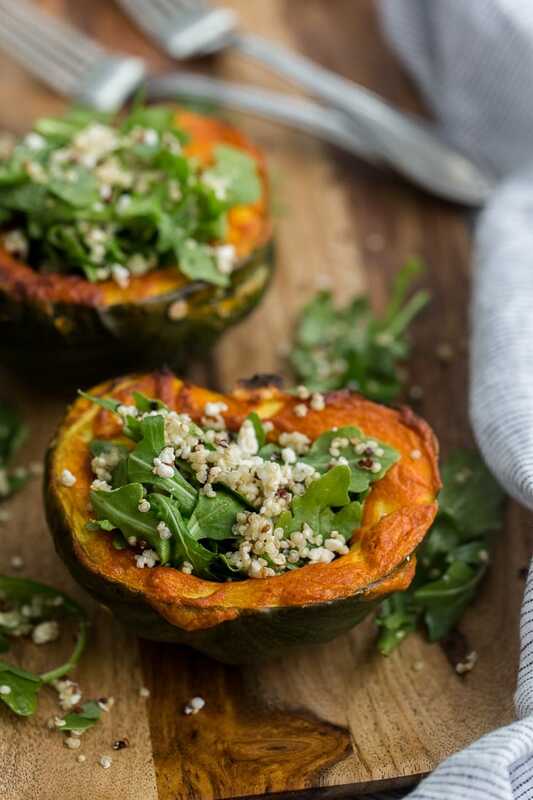 While squash is roasting, combine arugula, quinoa, and feta in a bowl. In a small bowl, whisk together olive oil, lemon juice, and honey. Pour over arugula and toss until well coated. 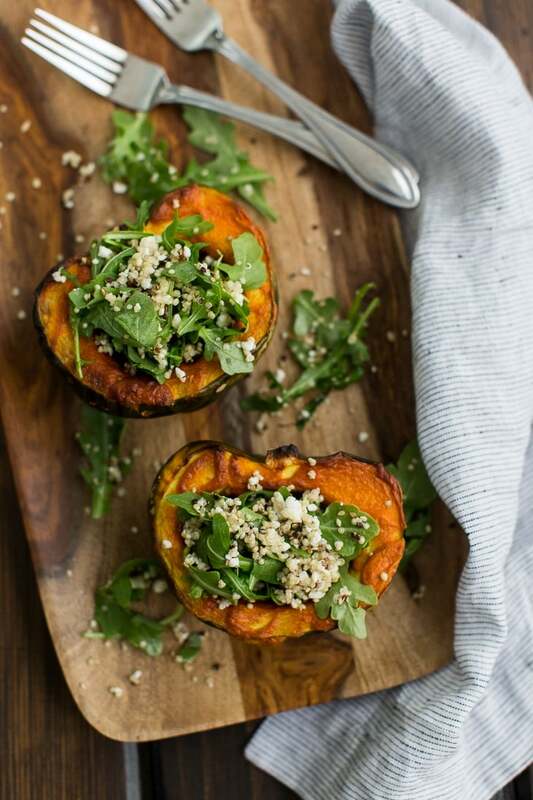 Once squash is tender, divide arugula into the squash and serve. Notes: I tend to use Thai Kitchen red curry paste which is fairly mild. Also, in a pinch, using 1 tablespoon curry powdered would work as well. this looks absolutely delicious! I will have to try it! This looks amazing! I love the slight curry flavour yum! 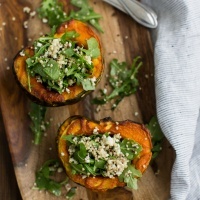 Mmm…I’m digging salad-stuffed squashes, too! I love that the squash is an embodiment of your outlook for the new year. Acorn squash is so delicious, I think it’s one of my favourite types of squash. Hope you’ve had happy holidays! YUM!! Great recipe!! Looks so healthy and nourishing!! Perf for this time of year! …and I have an acorn squash waiting to be made!!! YUM!! This is a perfect recipe for after the (unhealthy) holiday gatherings! Thank you for sharing, I can’t wait to try it! This looks delicious! I love discovering new ways to use up my winter squash 🙂 What a lovely combination! Happy New Year!